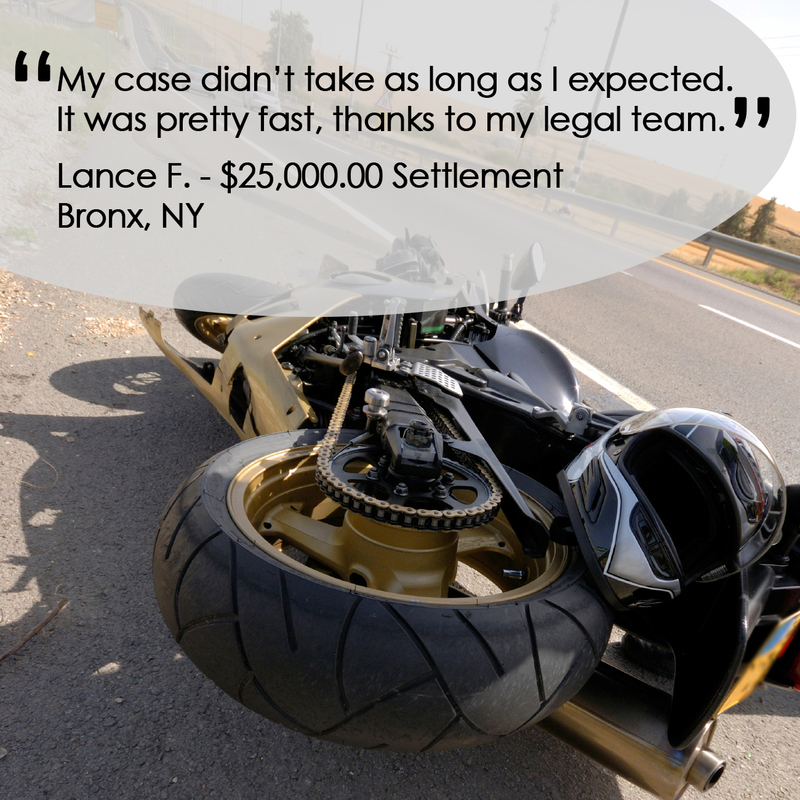 Home / Case Results / Long Island Motorcycle Accident Lawyer Review: Lance F.
Long Island Motorcycle Accident Lawyer Review: Lance F.
On August 21, 2016, Lance was riding his motorcycle at about 30 MPH in the left lane when he noticed a vehicle dangerously weaving in and out of traffic lanes. The vehicle made a sudden left turn and struck Lance off of his motorcycle. Lance suffered abrasions to his right knee and right elbow. After the accident, Lance was taken to Montefiore Medical Center in Bronx, New York to receive emergency medical attention. Difficulty using stairs and symptoms of locking and buckling of right knee. Lance’s sister referred him to Adam Handler (thank you sister)! Our team helped Lance receive proper medical care to treat his injured right knee. Prior to the end of his medical treatment, The Case Handler team began transmitting each and every medical record and medical bill to the insurance company. After records began piling up, the insurance company agreed to provide our client with the maximum policy limit, which is the highest amount possible to compensate Lance for his injuries! As an experienced motorcycle accident lawyer, Adam Handler also ensured that all of Lance’s medical bills were paid by the at-fault driver’s insurance company despite New York’s law that an injured victim in motorcycle accidents would be personally responsible for their own bills. The Result: $25,000.00 settlement agreement. Even as a safe motorcyclist, there is no guarantee that an accident will never happen. Our client’s life was changed in an instant because of the reckless behavior of another vehicle. According to the New York State DMV, there were 4,750 motorcycle related crashes in 2014. While we always say we hope you never need our help, our Long Island motorcycle accident lawyers are here for you if you do. For a free and confidential consultation, contact us at 929-223-4195.